Danish Minister of Foreign Affairs Anders Samuelsen and Alibaba Group Executive Vice Chairman Joe Tsai witness the signing of a Memorandum of Understanding between Alibaba Group and the Danish Ministry of Foreign Affairs to enable Danish companies access Alibaba's 443 million annual active buyers in China. Hangzhou, China, March 12, 2017 - In a ceremony at Alibaba's headquarters in Hangzhou today, Alibaba Group Executive Vice-Chairman Joseph Tsai and Danish Minister of Foreign Affairs Anders Samuelsen witnessed the signing of a memorandum of understanding (MoU) to increase exports from Denmark to China and promote Denmark as a tourist destination of choice for Chinese travelers. The event saw the unveiling of the new Denmark Pavilion on Alibaba's Tmall Global imported goods marketplace, enabling Danish producers of fashion, lifestyle, home and food products to reach the over 440 million annual active buyers on Alibaba's e-commerce platforms, and introduces Chinese consumers to high quality, unique products from Denmark. The concept of country pavilions was developed to help customers on Tmall Global become acquainted with the culture and authentic products from countries around the world. The new pavilion launches with more than 20 brands selling high-quality Danish products in the fashion, lifestyle, home and food categories. Leading Danish merchants at the ceremony hosted live-streaming sessions on the Tmall mobile app to introduce their brands and products directly to Chinese consumers as the pavilion went live. Participating Danish brands include Bang & Olufsen, Jacob Jensen Design, ECCO, ONLY and Vero Moda. 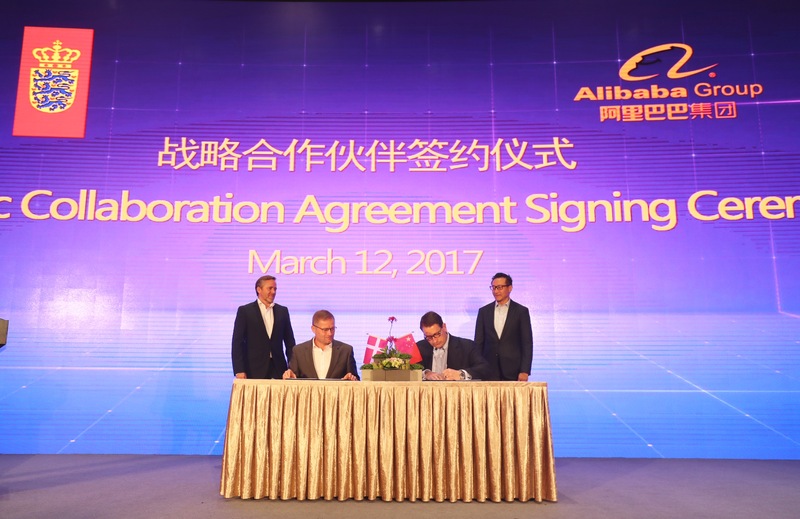 Alibaba Group and the Government of Denmark will also strengthen cooperation in anticounterfeiting and the protection of intellectual property. Tapping into the rising popularity of Denmark as a travel destination of choice for Chinese travelers, an official Danish Pavilion has been established on Alibaba's travel booking platform, Fliggy, which offers travel tips provided by the Danish Embassy, Danish Consulate and Visit Denmark (Fliggy's second Nordic European tourism board strategic partner). Denmark will also be the first country in the world to participate in Fliggy's visa innovation program by creating an official visa information platform. In addition, a strategic cooperation agreement was signed between Fliggy and Scandinavian Airlines (SAS) which will see a new SAS flagship store open on Fliggy, bringing the total number of airlines which have established a flagship store on Fliggy to more than 20. Speaking at the signing ceremony at Alibaba Group's headquarters, both Mr. Tsai and Minister Samuelsen emphasized that collaboration between Alibaba Group and the Danish government will help to expand the flow of high-quality Danish products to the world's largest e-commerce consumer market. "I am pleased to formalize our efforts with Denmark and open the Denmark Pavilions on Tmall Global and Fliggy, allowing Alibaba to serve Danish businesses of all sizes with direct access to the growing Chinese middle-class market," commented Joe Tsai, Alibaba Group Executive Vice-Chairman. "Danish design, art and lifestyle are admired all over the world for their sophistication and minimalism, and there is no doubt that Danish products will become even more popular amongst Chinese customers, enticing an ever-growing number of them to want to travel to the country themselves." "China is a very promising, but also a challenging market for many Danish companies. Chinese consumers have often limited knowledge of Danish products and with the opening of an official Danish pavilion on China's leading e-commerce market place Tmall Global, we hope to draw attention to Danish products and brands. More and more retail is happening online and more in China than anywhere else - it is therefore important that the Danish Foreign Ministry can support Danish companies' success in this particular area. I believe the establishment of an Official Danish Pavilion on Tmall Global is an important step in that direction," said Foreign Minister Anders Samuelsen.